Population health is the health of all people living in a given place, such as New York City, Kansas, or Bangladesh. It also refers to differences in health – for example, between the rich and the poor. A population’s health is the product of many causes, operating at many levels “from cells to society” (see infographic below). Research to understand these causes can point to new ways to improve population health — see “How Can Population Health Science Improve Health?“ for examples. Your zip code matters more than your genetic code when it comes to health. “The Power of Place: A tale of two twelve year-olds” tells the story of Ella and Amara, and how their prospects for healthy lives are shaped by where they live. Finding effective ways to improve population health requires both science and action. 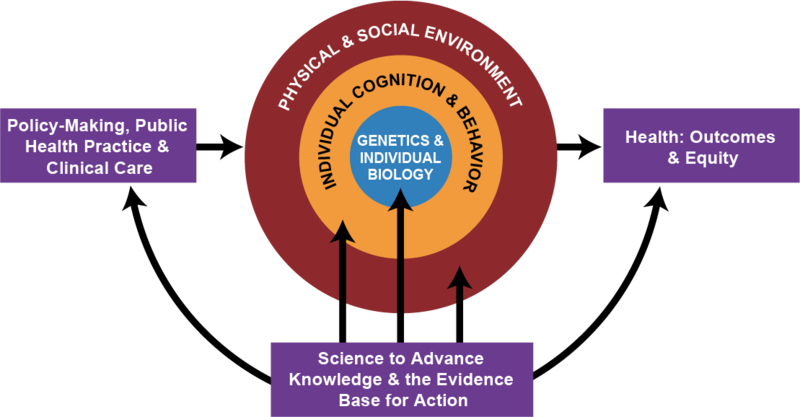 Science provides for the systematic study of the causes of and potential solutions for population health problems; action engages people, institutions, and communities in efforts to improve health. Each needs to inform the other. Population health science is an interdisciplinary and multi-method approach to producing knowledge about: population health levels & disparities; the intertwined & multi-level causes of health and disease, from genes, to behavior, to social and physical environments; the mechanisms through which health and health disparities are produced; and what policies and practices will improve population health and ameliorate health disparities. Population health science includes: local to global populations, studies of population subgroups, basic to applied research, diverse health outcomes and conditions, many different scientific methods and tools, contributions from diverse disciplines and sectors. Population health action seeks to improve health and promote health equity through interventions, policies, and practices at the local, regional, and national levels by implementing the findings of population health science. It seeks to enlist multiple sectors – such as business, education, health care, housing, urban planning & community development, transportation, social services, government, and more – in strategic action to improve population health. In turn, the practice of population health action also reveals new questions and issues for population health science to investigate. For some examples of population health action, read about the 2017 winners of the Robert Wood Johnson Foundation Culture of Health Prize. Populations are most generally defined as individuals residing within a common area (like a nation, region, community or neighborhood). However, the term is being used in many different ways in current health-related discussions. It can refer to groups of people sharing common sociodemographic characteristics such as age, race/ethnicity, gender or economic status; individuals with a specific disease or condition; and people served by the same health care provider, health plan or insurer. IAPHS emphasizes the first and second definitions for two reasons. First, a focus on patient populations tends to divert attention from causes of health (and ways to improve it) that occur at the community, nation, or higher levels. Second, individuals who lack specific diagnoses or institutional providers may be most at-risk for poor health outcomes. However, all four definitions can be embraced within IAPHS’s vision. THE AFFORDABLE HEALTH CARE ACT ASKED HEALTH CARE ORGANIZATIONS TO IMPROVE POPULATION HEALTH. IS THIS THE SAME THING? The Affordable Care and Patient Protection Act mandated that payment to Accountable Care Organizations (ACOs) be based on health outcomes of the populations being served and not the volume of services provided. Inspired by the “Triple Aim,” ACOs’ efforts to improve health outcomes while reducing costs are labelled “population health.” These efforts fit within the IAPHS vision of population health, but the IAPHS vision is broader in several ways. First, ACO efforts tend to target the patient populations they serve rather than whole communities (although there are some exceptions). Second, health-improvement strategies tend to be centered around quality of care and individual-level interventions, leaving out a very important aspect of population health – improving the contexts that make people healthy or sick. WHAT CAN POPULATION HEALTH SCIENCE CONTRIBUTE TO ACHIEVING HEALTH EQUITY? Population health is fundamentally concerned with understanding and reducing disparities in health among different population groups. Because this is both a scientific issue and an ethical one, many population health researchers use the term health equity to describe this important focus. The interdisciplinary, multi-level approach used in population health science is essential here because many of the causes of disparities are social and economic conditions that operate beyond the individual level and demand upstream solutions. IS POPULATION HEALTH ONLY ABOUT "UPSTREAM" FACTORS THAT AFFECT HEALTH? No, it has a unique emphasis on upstream – or contextual – factors such as school systems, workplace policies, economic inequality, and safety net programs because these factors can have a broad impact on populations. However, the effects of upstream factors on health can’t be fully understood without studying cognitive, biological, and behavioral mechanisms that link them to disease, disability, and resilience. Population health considers the multiple levels of factors that drive health and how these levels intersect.